I’ve been unabashedly reveling in every morning where we evade the chill for one more day, where I can ride my bike to work in a skirt and short sleeve shirt, where I can sit on the porch after dinner and not feel that mercury drop and the gooseflesh form. But hey — all that stopped early this week, with a final burst of indian summer and the subsequent autumn arrival. Time for scarves and cider and music that makes me feel thoughtful, wistful, warm. Once the inspiration hit, this mix was almost harder than the summer mix I made. Summer mixes are all about toe-tapping fun and driving around with the windows down, singing along at full volume. In examining my iTunes library, I realized that perhaps I am drawn intrinsically, year-round to this sort of autumnal music, those songs with heft and subtle strength and acoustic coziness, maybe of the hippie beards-and-sweaters variety. As much as I love the hot days of summer, I do look forward to the quiet introspection of fall. Because, for me, there’s no other artist that evokes autumn for me as thoroughly and immediately as Dylan. The organ crescendo in this song feels like an October carnival, exploding with caramel apples and the smell of leaves burning. Slow Dance – Coco et Co. This duo from Montreal has woven together a rich and gorgeous album, the sparse iciness of melody here anchored by the warm Springsteenesque timbre of Andrew Sisk and the interwoven frost of Miranda Durka. It’s autumn and winter in one song. You can get their album here for $5. I cannot say enough good things about these guys. This song from their self-titled debut (easily one of my favorites of the year) is steeped in referential nods to all sorts of old, good country songs and emanates a road-weary ennui. The violin also breaks my heart. I’m presenting their Nov 5th show in Denver: stay tuned for a ticket giveaway next week! Magnet (Even Johansen) warms his native Norway nights with this substantial stomping, clapping, banjo-laced gem. These days can feel too short, too dark by the time we get off work, and we need a reminder that sometimes the blues is just a passing bird. Remember that warm seeping feeling in your chest when you first listened to the magnificent slow burn of “Orange Sky“? This song (from San Francisco songwriter John Craigie) infuses a distinctly Western-landscape haze into that sensation. I love this song. One original review of this album in ’03 called it “the perfect autumnal album.” I agree. This gorgeous, smart album and Dan’s oaky, warm voice have been a major part of my last few months and I don’t plan to stop. This atmospheric song from the Kerouac-inspired ode from Gibbard and Farrar makes me taste fog and smell pine trees on the California coast. A reader suggested this intricate instrumental as the perfect fall song and I concur. This Portland trio crafts lo-fi, compelling music that I love. Fittingly recorded in a bedroom, as a home demo. David Gray has always felt like an October artist to me (or maybe January, but that’s another mix altogether). This melancholy piano song is fitting for this time of year when everything is being transformed by the chill. Boulder’s bright star Gregory Alan Isakov injects a knowing, earnest rusticism into the mix. This Saddle Creek band recorded their stellar debut album with lots of whiskey and dancing in an Oregon hillside cabin. That sounds like an excellent fall weekend. “Autumn blew the quilt right off the perfect bed she made / And she’s chosen to believe in the hymns her mother sings / Sunday pulls its children from their piles of fallen leaves.” Autumn isn’t autumn without Iron & Wine, yes? Or Bon Iver as well? This cover is from the Record Store Day split 7″ I bought and have surely worn a groove in by now, a slow and haunting cover, with plucking banjo that sounds for all the world like rain on a tin roof. 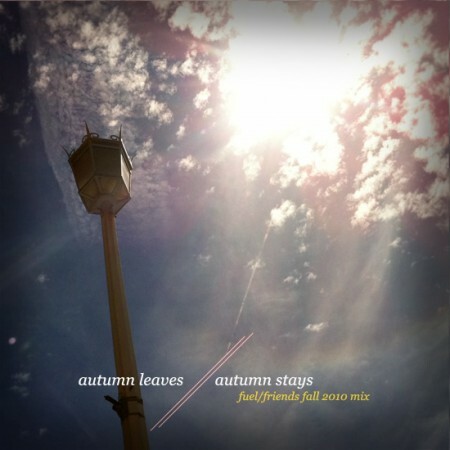 An acoustic folk album full of slow-reveal hues from this former Slowdive frontman, this was one of my favorites of 2008 and I always pull it out when the leaves start to change. Like a wise Joni Mitchell in fresh 20-year-old skin, Laura Marling wows the socks off me. I can go for the Mumford & Sons sound any time of year, but they are coming to Denver at the end of this month and I am looking forward to it as a contender for show of this season (their Telluride one surely was for summer). Blind Pilot’s smoky, rootsy, bittersweet warmth made them a shoo-in for this mix, and I was excited to find this new song that they’ve been playing live. This was recorded at MusicFestNW in Portland. One of the most perfect “slow-dance in stocking feet, finish your whiskey while you rest your head on my chest” songs that M. Ward has ever written. This is one of my new favorite bands, and this singalong version of the closing track on their scuzzy, gospelly, phenomenally-good debut album is everything I want in music. Stay tuned this week for details of a house show I am throwing with them on November 4th! Tagged with heather's mixes of awesomeness. Very nice, thanks for the upload. Is it sad that this just made my weekend? I can’t wait to dig into the artists unbeknownst to me and am so excited to hear the Blind Pilot and The National rarities, I’m gonna go buy me some cider right now. About half the bands I never heard of in your summer mix made it into my regular rotation. Nice stuff – thanks for posting. This is so perfect, Heather. Thanks! I found your site via The Head & the Heart’s FB page and wall post about your fall mix. You have a great ear! Thanks for sharing. The format rocks! you really tapped into the universal there. gorgeous. Hooray, been looking forward to a new mix from you! Looks like some fantastic names, can’t wait to have a listen! Great mix with good flow, Heather! Happy to see John Craigie on here – totally underrated and really great choice of song from him. you always have the best posts. when you do a mix, it’s something so magical. keep on rockin’! Thanks for this lovely mix. It’s the perfect background to some butternut-squash-ginger soup making on this fine fall day in Baltimore. This was the soundtrack to my Oktoberfest party in my backyard last night. It was a hit, my party and your soundtrack. Thanks! Truly a great mix Heather! What album did the Josh Ritter track come from, or is it just a live cover? Yes! I’ve been waiting for this since the summer (sad but true). Very nice work! Absolutely fantastic mix. ‘We are the Tide’ has been a favorite of mine since you posted it last year (granted it wasn’t very high quality, but the elements are there where you just know it’s a killer song). Also, just saw Sam Beam (with Rosie Thomas backing along with his friend Rob) last week in Iowa City and you’re right, there really is nothing better than Iron and Wine in the fall (and judging by the few new songs he played, his new album is going to be gorgeous). Thanks again for this, it’s great (and glad I could contribute a little bit). Adam — THANKS for the Si, Paloma rec. Just perfect. The link to the mixtape seems to be broken now, and it hurts my heart. This is a splendid collection. GREAT GREAT job again. The Josh Ritter inclusion, especially! I’ve been listening to the Jeffrey Foucault cover of this song a lot lately, and had totally forgotten about this cover! Here’s hoping the storm windows stay up for another couple of weeks. This mix looks fantastic, I can’t wait to listen! Very lovely mix. Based on your selections I think you would really like Matthew and the Atlas. I would start with the song I Will Remain. I fell in love with it after one listen and I think you might too. The link is fixed now for sure. Server error. Enjoy. This really is a mix of awesomeness. Thanks for a nice soundtrack for today and for many other fall days, and for turning me on to some wonderful new artists and songs. BB/chris – I DO love it. Thanks!! Thanks for the great mix. “Scattered Leaves” by The Be Good Tanyas is another amazing fall song, one that stirs the ambivalent emotions of transition. Heather, you are an angel. This post is priceless. Keep them coming! Heading to my (20th!, yikes!) college reunion this weekend and am going to turn this up to “11″. ¡Mil gracias por compartir! hey, thanks for putting up such a great mix and making it available to strangers. Much appreciated. And yeah, Autumn is the best time of year. Fall is absolutely my favorite season. Something about the leaves changing and falling, the air and the chill, and of course, football, does something to me inside. Only just recently did I realize how well the Avett Brothers go with this season. The slow version of “November Blue” is one of my favorites. Genius props to you for including it! Hey, I’m really interested to download the zip file of this mix but it doesn’t seem to be working. Any chance you could reupload it? That would be brilliant. i think it is a server issue, as i haven’t removed the file. maybe try again tomorrow or later today? Will do! Thanks so much for the quick reply, can’t wait to hear all the music. I just wanted to say amazing play list! Love it! Thank you!! Great mix! Song selection is perfect and I love the flow. Now there’s snow everywhere and your mixtape is still amazing.. Such a beautiful soundtrack for cold days..
Just some new about MTL based Coco et Co. They recorded a nice cover of Sara Smile for our HeroHall & Oates year-end mix. Enjoy! I have discovered so many new artists through your blog. I do believe, however, that The Tallest Man on Earth may just be my favorite, and this track is another great one! Thanks! This list is incredible! Mumford and Sons, Laura Marling, Gregory Alan Isakov, M. Ward, Neil Young . . . thank you for opening my eyes to these songs. Great work! I would just like to thank you for this mix. It has been a fantastic thing to listen to on cold, foggy, rainy, dreary days. Such good music all bundled up. This is a perfect mix. Thanks for your work & I’m delighted by your impeccable taste.